as possible and having your lawn cut higher. 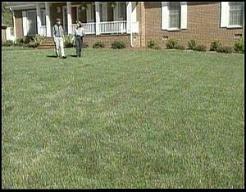 Your lawn should never be cut lower than 2 1/2 to 3 inches. applied as a to prevent crabgrass. it is much better for our well being and the environment. I would leave the final decision making up to you. always apply the correct seed mix to your lawn based on the amount of sunlight a particular area receives. areas and a Shady mix with Creeping Red Fescue solely in shady areas. increase the density of the turf. to decompose and begins to accumulate at the soil surface forming this thatch layer. difficult to make wet again. It also restricts the movement of pesticides, thus reducing their effectiveness. me by clicking the "Contact Us" button, or simply give me a call.